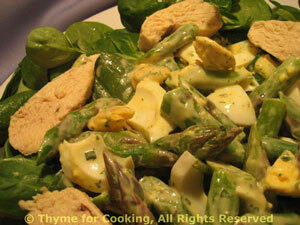 Spinach, Asparagus, Chicken Salad, Creamy Dressing, Thyme for Cooking. Based on an old-fashioned Egg Salad, this mayonnaise-based dressing coats the Asparagus Egg Salad nestled on a bed of spring greens and surrounded with slices of moist, poached chicken. Slice remaining meat off of the hens. Put chicken breasts in a skillet large enough to hold them easily. Add the stock and enough water to come half way up the sides of the breasts. Cover and bring to a boil. Reduce heat and simmer until done, about 12 minutes. Reserve stock for another use. Remove and slice. Snap off ends of asparagus. Cut asparagus into 1 inch (2.5 cm) lengths. Fill a large saucepan half full of water and bring to a boil over high heat. When boiling, drop in asparagus and parboil for 3 minutes. Prepare spinach; wash and spin dry if needed. When eggs are done, peel and roughly chop. Add to the bowl with the dressing, along with the asparagus. Stir gently to combine. Arrange greens on two plates. Spoon asparagus/egg salad in the center, dividing evenly. Arrange chicken around the edges. Serve.